Are you planning to renovate your bathroom décor? From the sanitary wares to various other aspects of your bathroom including essential furniture would play a determining factor in accentuating the overall décor. Each and every component of the bathroom is vital if you wish to impart it a classy and elegant look. As per the modern trend of bathroom designs, the interior designers also include some artistic and beautiful pieces of furniture in the bathroom spaces to make them appear more functional and contemporary. Select the Right Cabinets: Gone are the days when the essential items belonging to the bathroom like shampoos, soaps, and so more were kept in separate storage areas of the home. The bathrooms of the recent times are well-equipped with bathroom cabinets that can be used for storing such items with much ease. The presence of designer bathroom cabinets not only resolved your storage issues, but also tends to enhance the overall look. Therefore, you must make the wise selection of the bathroom cabinets that suit your style. Decide on the Perfect Finish: Whenever furniture of any part of the house is concerned, the finish plays an important role in determining its durability. In case of bathrooms, the finish of the furniture items like cabinets, drawers and so more need to be highly durable as they would be subject to constant exposure to moisture and wear & tear. The finish of the furniture should also complement the overall décor of the bathroom. Enhance the Bathroom Accessories: The furniture displays in the bathroom can also be used to enhance the look of the other bathroom accessories including sanitary ware, bathroom sinks and so more in an elegant manner. The bathroom cabinets can be placed over the sink area to offer great style as well as ease of accessibility. At the same time, the area around the sanitary ware can also be utilized for storing bench of drawers and other furniture pieces. Modular Bathroom Furniture: Everything in the modern world calls for being modular and in high design. Then, why should your bathrooms be left alone? You can add a touch of modish design by including lifestyle furniture items that can be customized as per your style and functionality requirements. Floor Mounted Vs Wall Hanging: There are two great options for storing the furniture in your bathrooms –it could be as wall-hanging or floor mounted. Both are great options and can be selected as per your personal choice. Both the furniture settings work great to enhance the décor of your bathroom space. Consider Maintenance: While installing furniture in your bathrooms, you must consider the cleaning and maintenance factors as well. The furniture pieces should be durable enough to last for a longer period. Moreover, they should also be easy to clean and maintain on a daily basis. Look out for the best wood quality and finish options. If you are planning to renovate or design your bathroom, then you must consider decorating each aspect of the same. 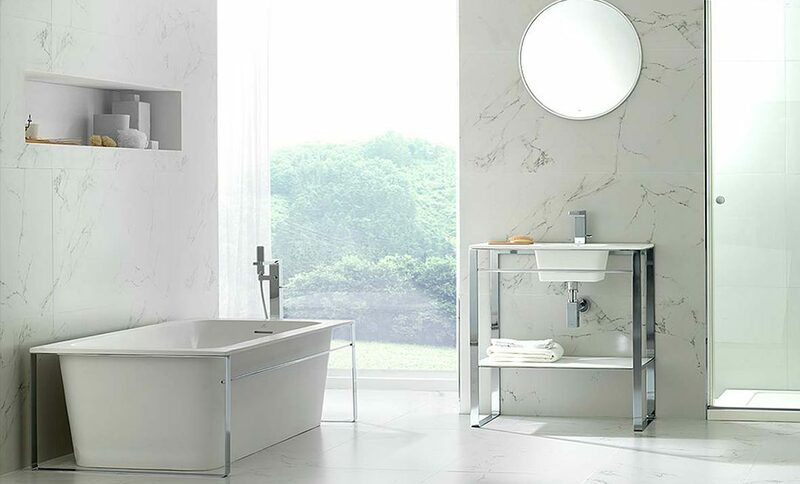 From the installation of the designer sanitary ware, bathroom faucets and so more, the bathroom furniture items could also play a significant role in improving the interiors of the bathrooms.